The Rose of Sharon is a flowering deciduous shrub that is also commonly called the Hibiscus by many gardeners. Originally native to parts of Asia, the Rose of Sharon tends to be a very low maintenance plant that does very well in mediocre soil types, provided the location gets a lot of sunlight and drains reasonably well. 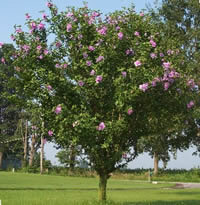 Rose of Sharon bushes are late bloomers, so they are an excellent partner plant for early bloomers such as bulb plants. Let your spring bulbs welcome in the growing season and then let the Rose of Sharon shrubs fill your garden with color in the late summer and through the fall months. What makes these shrubs such a favorite of growers is that they are vigorous growers and profuse bloomers. They are also very fond of the heat so if yours is a climate of hot, dry summers, this is the plant for you! The Rose of Sharon is a shrub that grows on multiple stems, however they lend themselves very well to pruning if you desire a certain shape. One popular pruning method is to have the plant form a single tree trunk shape, with a canopy of leaves and flowers at the top. If you are going to force your shrubs into a particular shape, pruning is best started in the first years of the plant's life. You typically will prune your shrubs in late winter before the new growth season starts. If you do not prune your Rose of Sharon bushes, they will grow very big and have very prolific blooming cycles with a lot of smaller flowers. If you prune them heavily, they will grow fewer flowers, but the ones they do will be much larger. It all depends on what type of shrub you would like to have. There are roughly a dozen commonly found colors of Rose of Sharon that many garden centers will carry for sale. They range in color from white, to purples and blues, to reds, with some varieties having two toned blooms. We will go over a couple of the varieties below. 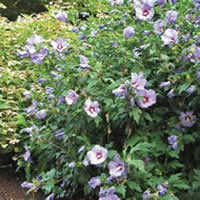 The Blue Satin Rose of Sharon is an extremely strong bloomer that is sure to find a home in any of your landscaping ideas. When this shrub reaches maturity, you can expect to see many gorgeous 3 inch diameter royal blue blooms with magenta two tones and cream colored centers. This particular variety is very uniform with its blooms as well. This variety will grow as tall as 12 feet and equally as wide if left unpruned. It is hardy in zones 5 through 10. The Blush Satin Rose of Sharon is a very attractive bush that offers a lengthy blooming season filled with light pink flowers that feature stunning reddish colored centers. Blush Satin is a far more hardy variety than other Rose of Sharon bushes as it is very resistant to drought and heat, as well as pollution. Like most varieties however it will offer you the best results if you can plant it in a sunny location that drains well. If you live in a southern climate where the weather is warmer longer, you can get away with planting this bush in areas that receive light shade. 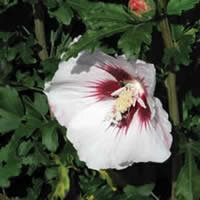 The Lil' Kim is a very unique variety of Rose of Sharon in that it doesn't reach the heights of many of its cousins. This particular bush, while similar in appearance to the Stain Blush only grows to about 4 feet tall at its height. Once it starts to bloom you will be amazed by the 3 inch diameter flowers with their classy red centers that have a longer lifespan of other Rose of Sharons. This showy plant was created in South Korea and it is believed that it is the only Rose of Sharon to be offered in a miniature variety. This opens up a realm of landscaping possibilities that just aren't practical with other varieties. The Sugar Tip Rose of Sharon is an elegant variety that features double pink flowers when it blooms as well as variegated leaves that are unique to these types of plants. The green foliage with its cream colored edges is sure to make a statement in any landscaping idea. Another unique feature about Sugar Tip is after it blooms it does not produce seeds like other varieties, making it an ideal candidate for any climate. You can allow this bush to grow large with profuse smaller flowers, or you can give it a hard pruning every spring for larger but fewer flowers. 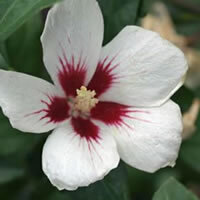 The White Chiffon hibiscus is an instant classic and can be worked into any of your landscaping ideas. It's large white blooms come with a delicate lacey center that will make any location you plant this in look charming and elegant. This variety will grow up to about 8 to 12 feet tall when it reaches full maturity and it will spread out to about 5 feet wide. 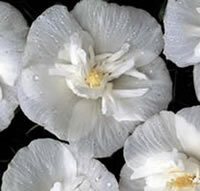 The White Chiffon Rose of Sharon is hardy in zones 5 through 9. The Red Rose hibiscus is a real stunner among its kind with great big red blooms that start in June and last through October. This bush is extremely adaptable and it hardy down to zone 5 with a little basic care. 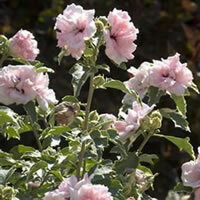 Many growers call this the "tropical" Rose of Sharon! You will be amazed at how large the blooms actually get on this plant when they have the ability to get as big as dish plates! This variety is very popular among pollinating insects as well. 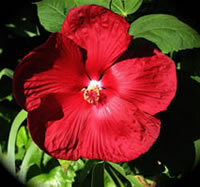 The Red Rose of Sharon bushes are a real eye-catcher that will add beauty to any landscaping ideas.